“My Flight Through Cancer” from Christian Faith Publishing author Kenny Tipton is an inspirational and captivating story of struggle and survival. This book is about more than cancer; it is about learning to let go of ego, making mistakes, sharing life, and having faith. “My Flight Through Cancer”: a gripping and inspirational story of struggle and survival. 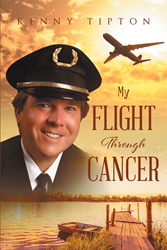 “My Flight Through Cancer” is the creation of the late author, Kenny Tipton, a pilot for a major commercial airline and a stage IV cancer survivor. Kenny has passed away, from issues unrelated to cancer. Published by Christian Faith Publishing, Kenny Tipton’s book is a captivating and inspirational story of struggle and survival. This book is about more than cancer; it is about letting ego go and sharing life in intimate details. It is about love and passion, about being humbled, making mistakes and finding the right path. It is about learning to rely on others to help in the simplest of tasks, and keeping and finding more faith than imaginable. Kenny Tipton shares that the hardest part about cancer, or any other debilitating disease, is that so many people do not understand what the person is going through during this horrific time. On the outside they may look healthy, but people with these diseases are fighting incredible battles on the inside. Kenny asks for people to show them compassion, understanding and kindness. Leave judgment on the table; regardless of a person’s past, no one deserves the pain of loneliness and disease. The proceeds from the book that would've been paid to Kenny will now be contributed to Assistance in Healthcare, which supports cancer patients and their families. View a synopsis of “My Flight Through Cancer” on YouTube. Consumers can purchase “My Flight Through Cancer” at traditional brick & mortar bookstores, or online at Amazon.com, Apple iTunes store, Kobo or Barnes and Noble. For additional information or inquiries about “My Flight Through Cancer”, contact the Christian Faith Publishing media department at 866-554-0919.